on Wednesday, November 28 at 5:30 p.m.
or call Tricia at 845.661.3002. 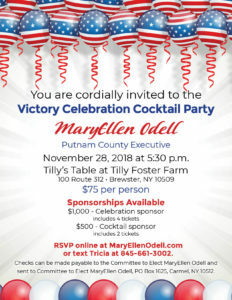 Donations can be made to The Committee to Elect MaryEllenOdell, P.O. Box 1625, Carmel N.Y. 10512.